In celebration of National Environmental Education Week and Earth Day next Tuesday April 22, I want to take this opportunity to thank all of the people who read my blog in the United States and around the world. TeachGreenBlog now has readership in over 30 countries! I appreciate your continued support and shared interest in environmental education. Today, I am pleased to announce the launch of The Green Beans & the Litterbugs at www.getgreenandgrow.com. For the past three years, I have been working with three of my talented and accomplished cousins to develop a unique model of interactive green entertainment for young children and their families. We envision The Green Beans & the Litterbugs as a franchise of engaging children’s programs, trade and ebooks, online games, webisodes, toys and other associated products. The Green Beans stories are designed to entertain young audiences, while promoting basic environmental themes, cultural diversity and positive social behaviors. We have carefully constructed The Green Beans & the Litterbugs with an international worldview. We adhere to environmentally sustainable practices and support the United Nations’ definition of sustainability, “to meet the needs of current generations without compromising the ability of future generations to meet their own needs.” Initially, we are using our newly launched website and social media to spread the word. 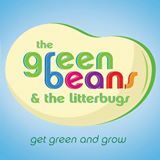 The Green Beans & the Litterbugs features five members of the Green Bean Team – Ruby Monkey Bean, Bella Brontosaurus Bean, Bentley Bear Bean, Gibbon Monkey Bean, and Crawford Crab Bean. With the help of their roving satellite Bloorb, the Beans travel the globe solving environmental emergencies caused by the Litterbugs. Each Green Bean story highlights a different ecological issue that becomes part of the plot. Real world environmental challenges are placed in the context of animated action that children can absorb and understand. In order to shape a positive message, we created the Green Beans content with two important themes that run through the story lines. The first is a “green” theme highlighting an environmental issue in a specific geographical location that becomes the setting of the story. Young viewers will have the opportunity to observe how the Green Beans work as a team to respond to the problem, determine its cause and use logic to find a sustainable solution. The second element that runs through the stories is a “character” theme. Virtues such as truthfulness, helping others and the importance of family are just a few of the positive traits that are subtly embedded into the plot to reinforce pro-social behaviors. These traits are demonstrated in the actions of the Green Beans and help children learn tolerance and conflict resolution by observing their positive example. The Green Beans & the Litterbugs is designed to also provide factual information about nature and the environment that can even be used as a supplement to classroom curriculum. Our website is full of interesting “field facts” pertaining to geography, habitats, flora, fauna and cultural influences on the environment. We host “Bloorb’s Blog” with up-to-date information on green events, activities and crafts, as well as sustainable tips for healthy living. We also welcome feedback from children who are making a difference in their communities. It is truly a green movement designed just for kids. It is our ultimate goal to lead young viewers to a better understanding of the world around them in order to prepare for a sustainable future. We are seeking to partner with like-minded organizations that will join us in further developing The Green Beans & the Litterbugs for the benefit of kids everywhere. I hope you will visit our newly launched website at www.getgreenandgrow.com and “like” us on Facebook.